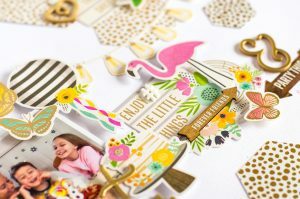 It's Party Time on the Patio with Guest Designer Flóra Farkas! 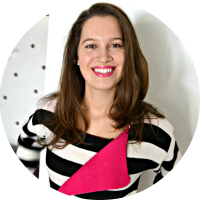 - Pebbles, Inc.
It’s Party Time on the Patio with Guest Designer Flóra Farkas! Hi Ladies! I am so happy to be the Pebbles Guest Designer this month. 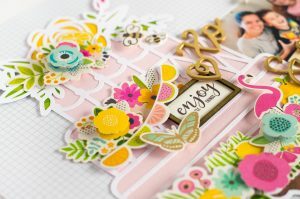 I created two 12×12 scrapbook layouts with the colorful Patio Party collection. I hope you will like them. For the first layout I cut out a cake from white cardstock and backed with Pati Party papers and light pink cardstock. Once the base was done I decorated the cake. 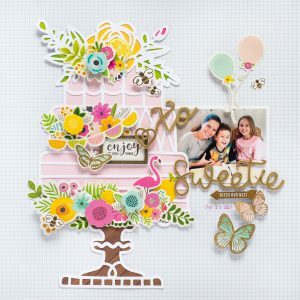 I got the idea of decoration from the cake die cuts from the collection. The flowers look so pretty on the cakes, so I added many Die Cuts, Cardstock Stickers and Layered Stickers. I also found few lemons what perfectly matches the theme. In the middle, I placed a small wooden table with the sentiment. On the right I placed my photo and over those lovely balloons. 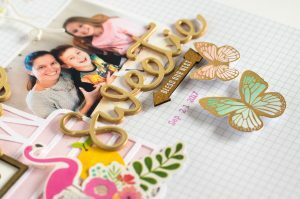 The title comes from the Forever My Always collection what coordinates perfectly with Patio Party. The second layout is the pair of the previous one because I used a photo from the same birthday. 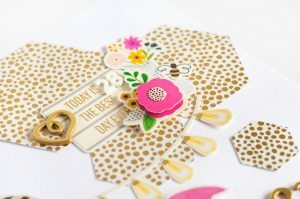 The 12×12 Paper Pad includes gorgeous gold foil papers and I grabbed this one with the tiny dots and cut out different size hexagons. I scattered them around the page and placed my photo. 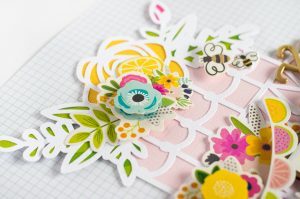 I embellished around with cute Die Cuts, Cardstock Stickers and Layered Stickers. I also created a cluster on the right upper corner just to balance my page. Again I used Forever My Always Thickers for the title. I really love the shine of the gold elements and the pops of pink on the page. 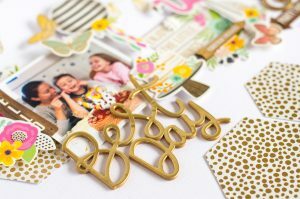 This collection is truly perfect for all your birthday and party memories. I was so happy to play with it and create these layouts. 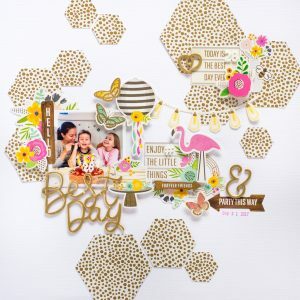 I hope you also like them in inspires you to make something pretty with Patio Party.